For book-lovers, it might be difficult to understand why others do not share the same joy in reading: the chance to gain more knowledge, get lost in another world, fall in love with characters or engage with new ideas. But sadly thousands of children leave primary school unable to read well enough to enjoy reading for pleasure. According to the Read on Get on Campaign, one quarter of all children left primary education without being able to read well each year. At the same time, the evidence about the benefits of reading is increasing. Reading is hugely important for both educational purposes and for personal development. It can help improve attainment, increase job prospects or provide an outlet for creativity. And this is the driving force behind The Publishers Association’s Reading Ambassador campaign. The aim is simple: help promote reading for pleasure around the UK. To do this, we are looking to recruit 10,000 reading ambassadors by 2020 to share their love of reading with others. 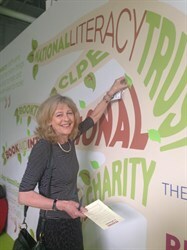 We have had some high profile ambassadors joining, including Deborah Moggach, the author of The Best Exotic Marigold Hotel and a passionate Reading for Pleasure ambassador. In an interview with the Society of Authors, Moggach talked about how important supporting reading for pleasure is for authors and their readers. As she notes, book reading faces multiple threats, from digital media to library closures, meaning that it is more important than ever to encourage new people to discover the enjoyment of getting lost in a good book. We have also been travelling to the places where book-lovers congregate to encourage more people to back our campaign. 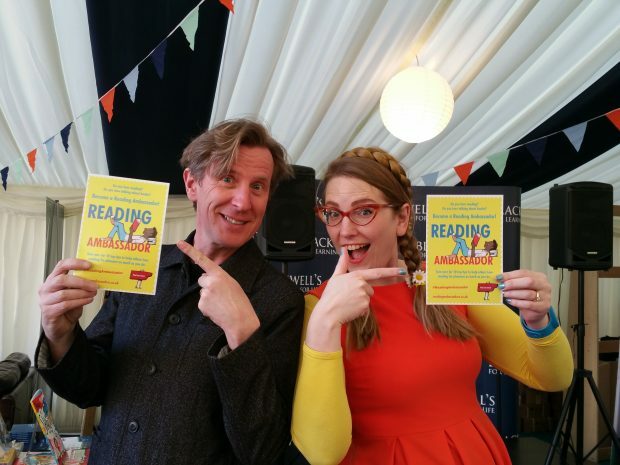 This summer we have travelled to Oxford Literary Festival, Hay Festival and Edinburgh International Book Festival, where we have spoken to librarians, teachers, mental health workers, parents and many others, about how they can share their love of reading in their community. We will also be travelling to Cheltenham Literary Festival in October. Meanwhile, we continue to support campaigns such as the BBC’s #LovetoRead and Save the Children’s Read On. Get On initiative to ensure that we’re all working towards the same goal: creating a reading for pleasure community. 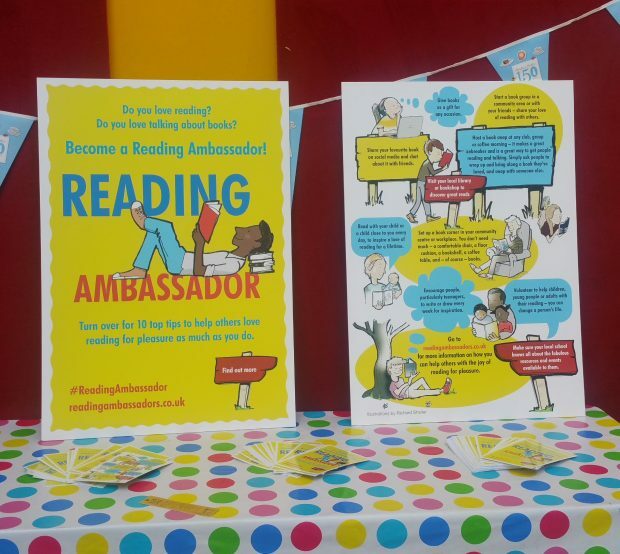 To help people get involved, we have created tips about how ambassadors can share their love of reading. Some are as simple as suggesting they spend more time reading with their children, or getting them to share their favourite book. And for others who have a bit more time to commit, we suggest volunteering at their local library or getting involved with a reading for pleasure charity. We highlight upcoming activities to our ambassadors, such as the Summer Reading Challenge; activities like World Book Night, and National Libraries Day will also provide a great catalyst to get more people encouraging others to read for pleasure. Reading for pleasure is a key step towards improving literacy standards and I believe that the people best placed to promote a love of reading are those who love it themselves. While some of things Reading Ambassadors can do are simple, they can have a huge impact on people’s lives. 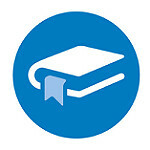 Sign up today at readingambassadors.co.uk where you can register for our newsletter and find out more.